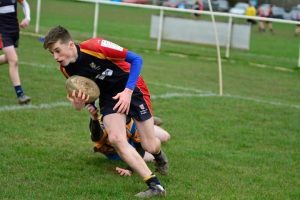 It was tour time for the Under 16s last weekend. Being GCSE year it was a trimmed down one night tour visiting Royal Leamington Spa. 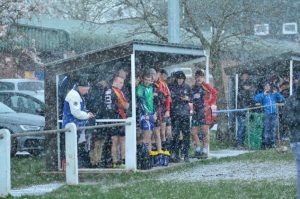 There was however as much if not more rugby on offer with matches on Saturday and Sunday. First stop was Leamington RFC where a B squad took on the hosts, while an A squad came up against Old Leamingtonians from very nearby. Both fixtures were extremely competitive as the boys tried to figure out how to play in the strong wind blowing across the pitches. Leamington scored first with a cross-kick taking an extremely favourable bounce for the wing to go over, opening a 7-0 lead. The hosts and visitors were trading blows as Chob’ held their own against the Leamington’s first choice squad. It was Leamington however who crossed again out wide with a very good conversion making it 14-0 at the first of two breaks. Chob’ struck back in the second period after an extended spell near the home line. A 5 yard scrum gave the backline the space to develop an opening and following a couple of phases it was Saxon who made the pass to Daniel to score the third try in the same corner. This time it was Samuel chasing the extra points. A drop goal effort swayed like a drunk up a hotel corridor before going over and the lead was back to just 7. Chob were now in the ascendancy and kept plugging away to find an equalising score. The hosts weren’t in generous mood on the field and soaked up everything Chob could throw at them. Leamington were able to turn their chances into points, benefitting from the odd mistake as Chob’ battled to get on terms. 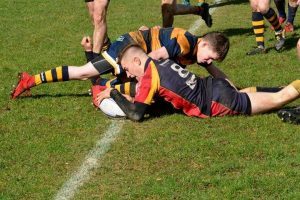 The final whistle came with Leamington as 33-7 winners which was scant reward for the effort and possession that the Chobham lads had carved out. On the next door pitch Chob were taking on Old Leamingtonians, fierce local rivals to our hosts. OL were clearly a well-drilled side who had a defined game plan that relied on close runners sucking in the defence before releasing the ball into a scrambling cover. This was well suited to the windy conditions, while Chob were attempting to play a more expansive game to stretch OL early. The opening score was a real throwback move, with OL getting a penalty near the Chob line. A 3 man pivot close to the scrum-half was looking to confuse the defence. The initial crash ball was resisted, but the follow up was able to squeeze over to take a 5-0 lead. 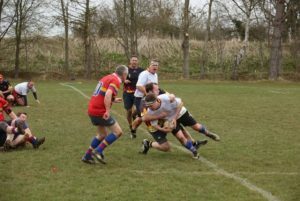 Chob’ found themselves struggling at the breakdown with the ref very quick to blow the ball carrier for holding on, and as a result couldn’t get any lengthy spells of territory or possession to strike back. The second period was dotted with some very good OL kicking using the wind to pin Chob back in their half. A second try for OL came from a loose ball in midfield with OL beating some rare soft tackles to score between the sticks. So 12-0 down, but Chob’ were starting to dictate the play a little, the set piece scrum being rock solid and the lineout picking off a few OL throws. Chob’s opening score came from a missed clearing kick from OL. Harry set off back into OL territory, ably supported by the backline. The forwards worked through a handful of phases which had the defence in disarray. It then needed Dan, Chris and Doug to draw their man and pass to give Aran plenty of room to go over and bring the score to 12-5 at the second break. The final period was as tight as the first two. OL got close with an 8 pick but were held up. Then with the first blemish at the scrum going against the head the OLL wing took the pass and barrelled over to stretch the lead to 17-5. Time was now running out but Chob’ scored next from a quick penalty. Akin going over after Rhys was stopped inches short. Gideon added the conversion and it was a 5 point game. OL must have been feeling the pressure as they spilled the restart, a very rare handling error. Chob’ got close to the line but were denied despite their best efforts and OL ran out narrow winners 17-12. If you thought that was the end of Saturday’s entertainment you could not have been more wrong. Many of the Dad’s now took the field, courtesy of a variety of brand new boots and borrowed kit that the boys had grown out of! Mixing in with Leamington a curtain raiser was played ahead of the Wales v Ireland match. Well it was probably a better watch than Italy v France. Plenty of tries were scored with Dave and Andre cropping up regularly on the score sheet. Not sure the final result, but it’s safe to say that Deep Heat and port were the winners. Well rested after a good night’s rest, the boys made a short trip to Barkers Butts near Coventry to play the home side and Telford who had travelled for a friendly fixture. After some confusion early on for the supporters, with both opposition sides playing in black and gold hoops the opening match was played against Telford. The Sunday fixtures were played as a combined mixed squad with plenty of rolling subs. Chobham were out of the blocks extremely quickly with Akin, Fin and Harry all going over and Gideon adding the conversions so it was 21-0 at the end of the half. Turning round Telford made a better fist of things, Harrison, Teo, Charlie and Lewis all making nuisances of themselves in black and gold. Andy showed what pace his old man used to have to extend the lead to 26-0 before Telford got on the score sheet on the whistle with a blindside break following a charge from the obligatory big kid giving a final score of 26-5. To the final action of the trip against Barker’s Butts who have a Warwickshire Cup final in a couple of weeks, so it would clearly be a tricky contest. Under darkening skies the opening exchanges were even. 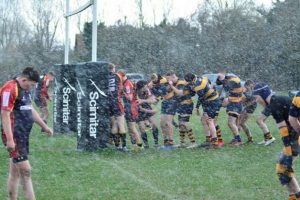 After 10 minutes a torrential hailstorm brought a temporary halt to proceedings, with both sets of backs cowering behind the posts. At the recommencement Chob’ were right on the BB line and Charlie was over in the corner to open up a narrow 5 point lead. Into the second period and BB with the wind play tight and make good ground around the fringes before kicking deep. The clearance was charged down and then hit a BB head before nestling into a BB players arms to level things at 5-5. With the kick hanging nicely MattN pouched the restart and Harrison burst through to the 25. Quick rucking gave BB no time to react and Fin powered through a gap to reach the line and hit back immediately with a 12-5 advantage. BB now had to hit back once more. From a high swirling kick BB got a foot to a bouncing ball and hacked deep into the Chob’ half. Chob conceded a scrum and BB moved wide immediately, creating an overlap against a narrow blue defensive line to cut the deficit to 12-10. With very little time left Chob were able to pin BB back from the kick-off and win a scrum. Again this had been rock solid all day whoever was involved. Chris committed both centres and Fin took a pop ball to crash into the BB 25. 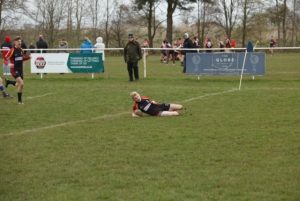 Olly then got his hands on the ball and took the game to a couple of yards of the try line. Harrison was first to react and had the strength to carry a couple of tacklers over the line and extend the lead to 17-10. The ref called full-time after the missed conversion and Chob had won 17-10. So ended another great tour with the boys all gelling across both squads and relative newcomers Jack and George picking up the ways of Chobham touring at the first attempt. Boys Squad: Akin, Andy, Aran, Ben, Billy, Callum, Charlie, Chris, Dan, Daniel, Doug, Fin, Finn, GeorgeC, Gideon, Harrison, Harry, Harvey, JackP, Lewis, MattN, Max, Olly, Rhys, Samuel, Saxon, Teo, Tommy. Dads Squad: Andre, Andy, David, Doug, Ed, Jamie, Matt, Pete, Simon, Steve, Will .